Iron Man 2 Blu-Ray Release Information - Date, Cover Art, Special Features For Blu-Ray, DVD Combo Pack of Iron Man 2 With Robert Downey Jr.
CHICAGO – Marvel Studios and Paramount Pictures sent over the cover art and all the juicy details regarding the September 28th, 2010 Blu-ray and DVD release of the smash hit “Iron Man 2.” Mark your calendars. 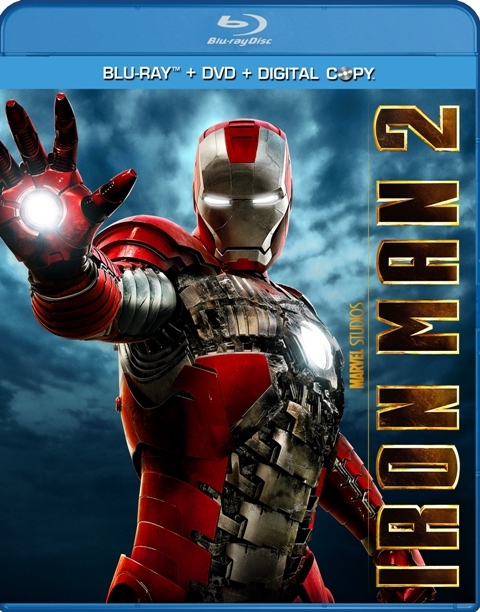 With over $300 million in domestic box office, “Iron Man 2” is easily one of the biggest hits of 2010 and the Blu-ray/DVD combo pack that’s been put together by Paramount looks like it will treat fans with the respect they deserve and once again deliver an amazing collection of special features. The Blu-ray for “Iron Man” was one of the best of 2008. “Iron Man 2” looks poised to take a similar title for 2010. The film will, of course, be presented in 1080p high definition with English 5.1 DTS-HD Master Audio, French 5.1 Dolby Digital, Spanish 5.1 Dolby Digital and Brazilian Portuguese 5.1 Dolby Digital and English, English SDH, French, Spanish and Brazilian Portuguese subtitles. The DVD is presented in widescreen enhanced for 16:9 TVs with Dolby Digital English 5.1 Surround, French 5.1 Surround and Spanish 5.1 Surround and English, French and Spanish subtitles. o S.H.I.E.L.D. Data Vault (HD)— Extend your knowledge of the Marvel Cinematic Universe with high-level clearance into S.H.I.E.L.D.’s digital data vault. Interact with select scenes from the movie that include new layers of graphics and insider information. View case files, dossiers, S.H.I.E.L.D. training films, tech details and more. o A Return to Action—From Marvel Studios to the streets of Monaco, Jon Favreau takes viewers through the trials and triumphs of continuing Iron Man’s story. o Expanding the Universe—From the amazing sets of Stark Expo to Tony Stark’s home and beyond, the Marvel Universe continues to unfold into new and exciting places. o Practical Meets Digital—How the “practical” props inform the “digital” work that ultimately brings our hero to life on screen.